I can't believe that we're already into the middle of October! All week I've been collecting inspirational fall decor photos to refresh the look and feel of our home. With the weather finally starting to cool down a tad here, I'm now ready to entertain the idea of porch display. If you haven't had the time yet to decorate your home, here are some inspirational ideas that will hopefully get your creative juices flowing for a stunning outdoor arrangement! 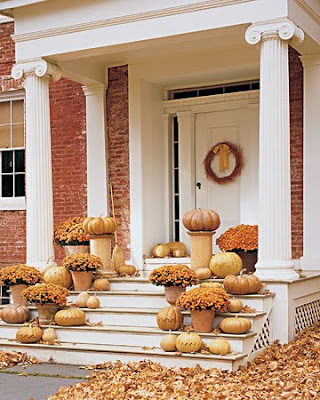 Leave it to Martha Stewart to create a stunning fall porch display! I love how beautiful this staircase is leading to this home. 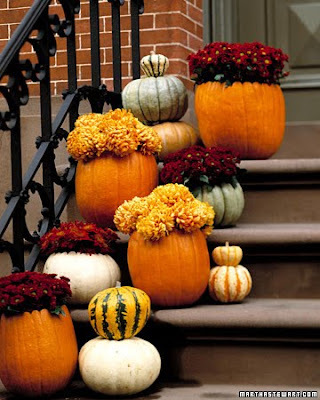 It's comprised of just two things: potted mums and pumpkins of varying sizes and shades. 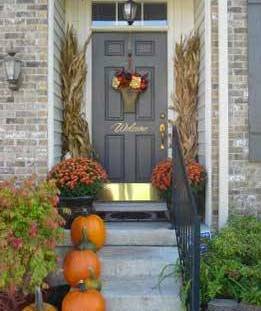 The wreath on the door is so simplistic, letting the beautiful porch display steal the spotlight! For those on a budget, you can use a smaller arrangement and get the same effect. Use multiple colors of potted mums for a vibrant porch or use a monochromatic scheme such as this one for a more streamlined look. For those with a heart for all things country, this is a charming little display. It's small, simple and to the point. 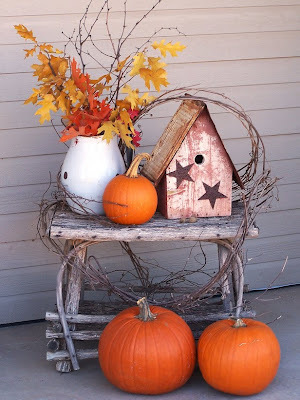 How is this for outdoor fall decor? 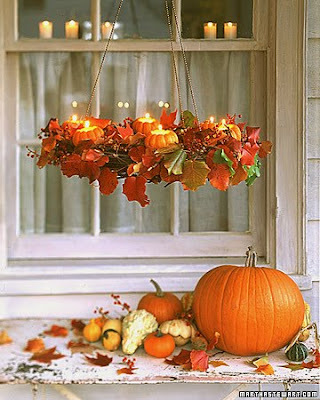 Using a backyard table, the chandelier was hung above created with leaves, mini pumpkin gourds and tea lights. Using more colorful and shapely gourds as well as a large pumpkin and an assortment of leaves, this rustic look is complete. Mums the word with this display. 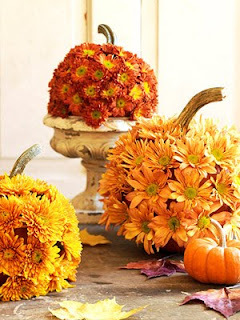 Colorful mum bouquets tucked inside orange and white pumpkins. These fun vases can add life to any step or staircase! These work best in climates with cool fall temps, as to preserve the freshness of the mums. Don't forget your windows! 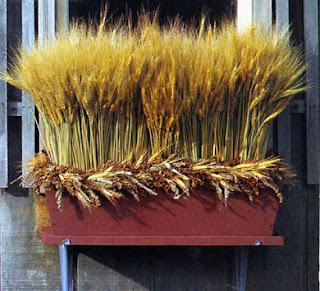 This planter box is a bit country-inspired as it is filled with wheat sheaths. Simple, yet so symbolic of harvest time. Use a constrasting color such as black or red for the planter box to really give it some 'pop'. To make these cute 'Mumkins' cut a lid and remove the seeds and pulp. Using a drill or nail, make holes just wide enough for the flower stems to poke through and insert the flowers. If you love the customization of monogams, add your family's surname initial to your wreath. Using pressed cardboard, you can paint the letter any color you like that will contrast from the color of the wreath so it will stand out. 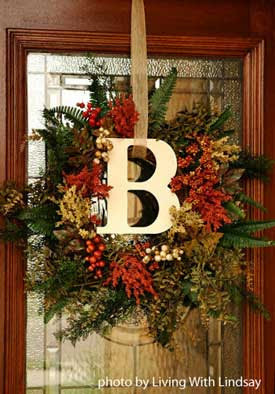 Using a little ribbon, you can adhere the initial to the wreath and hang it from an over-the-door hook. Why not try something a little different this year and personalize your pumpkin? 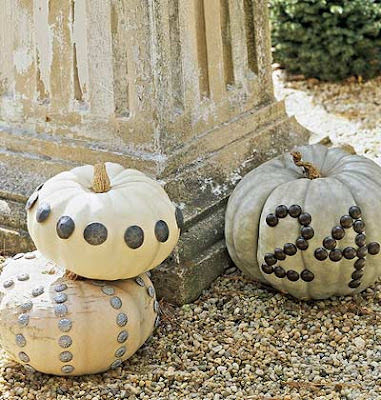 Add your house address or a fun pattern to your gourd with some inexpensive nail heads. They come in all shapes, sized and colors. you can also spraypaint them to get the exact color you want. I'm a huge fan of urns, especially those that you an place on either side of your front door, like these. Mine are black and I love placing bright mums inside for a festive look. I thought these pumpkin urns were also super cute. Place a gorgeous new welcome mat and a few more pumplins on the porch or bench and you're set! 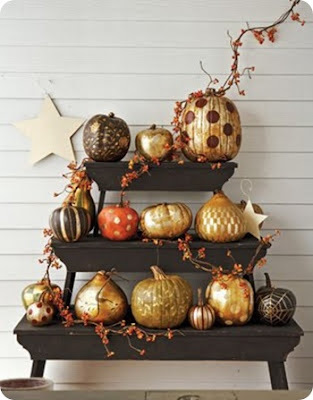 Using a ladder shelf you can re-create this look with multipe shapes and sizes of pumpkins. Get out some paint and get a little crazy with gold, silver, black, reds and create spider webs, polka dots, stripes and the like. 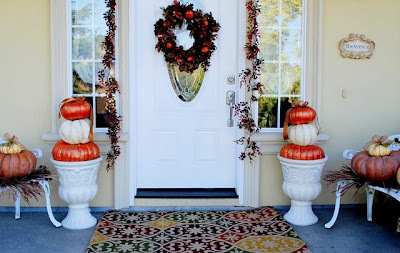 Use a little bit of leaves or garland as filler between various gourds to complete the look. I'm dreaming of mulling some hot apple cider, burning some cinnamon-scented candles, bringng the outside acorns inside and curling up in a warm blanket with a book as the windows are cracked open with a fresh, crisp breeze. Ahh, fall. It's here for some and on it's way for others. I can hardly wait! Did any of these images inspire you to try something different this year-tell us about it. What are your favorite aspects of fall? Do you love to decorate, or bake pumpkin pie? We'd love to hear what you have to say! Secrets to Fall Fashion for Less! Which Name Do You Use? Love Your Life & Fulfill Your Dreams! Fabulous Decor Finds for Under Five Dollars!